SANTIAGO, Jul 23 2009 (IPS) - El Tatio geyser field, a tourist destination in the northern Chilean region of Antofagasta, is at the heart of a controversy over a geothermal energy project being developed four kilometres away. The entire area is claimed by Atacama indigenous communities, who now stand divided. “For us, the geysers are the fountain of life,” Julio Ramos, president of the Council of Lickan Antay-Atacameño Peoples, an umbrella group of 25 communities, told this reporter. El Tatio is the largest geyser field in the southern hemisphere and the third largest in the world, with more than 100 springs erupting at an altitude of more than 4,000 metres in the Andes Mountains. Chile is rich in geothermal energy due to its location on the Pacific Ring of Fire. Geothermal heat is used to produce some 9,000 megawatts worldwide, with the United States, the Philippines and Mexico leading the way. Various measurements indicate Chile’s potential geothermal energy production at 3,000 megawatts. El Tatio, located in the community of Calama and owned by the Ministry of National Assets, was declared an area of touristic interest in 2002. But because the territory is claimed by the indigenous communities, in 2006, its administration was handed over to two native villages: Toconce and Caspana. According to Ramos, most of the Atacama Indians are opposed to the deep drilling that the Geotérmica del Norte consortium began in July 2008 in the Zoquete Ravine, four kilometres from the geysers. In fact, the government’s National Indigenous Development Corporation issued a negative report in the environmental impact assessment process. However, local leaders from Toconce and Caspana reached an agreement with Geotérmica del Norte, controlled by the National Geothermal Company, a consortium whose ownership is shared: 51 percent by the Italian state company ENEL and 49 percent by the National Petroleum Company of Chile. Caspana leader Gilberto Anza said in an interview that the project had brought his community a variety of benefits, such as placement of directional signs in the geyser field. The communities opposed to the project “haven’t informed themselves very well,” he said. Geotérmica del Norte’s 18-month plan entails drilling four boreholes 2,000 to 2,500 metres deep to assess the technical and economic feasibility of electrical production. Part of the extracted liquid is reinjected into the earth. If the feasibility results prove satisfactory, the company will apply for the necessary permits to build a geothermal energy plant. The decision could be made by the end of the year. “The project, which is already being carried out, showed in practice that there was no negative effect on the availability of water or on biodiversity,” a Geotérmica del Norte spokesperson told this reporter. According to Energy Minister Marcelo Tokman, water scarcity and tourism interests justify public concern about the energy project. The government hired a U.S. consultant to analyse the environmental impact report presented by Geotérmica del Norte. “What they have told us is that they are carrying out the perforations following all imposed restrictions, and that there has not been – as the scientific analyses anticipated – any negative impact on the geysers or water availability,” Tokman said in an interview for this article. However, the indigenous groups opposed to the project, backed by environmental organisations, local authorities and tourism operators, are convinced that sooner or later the energy project will pollute surface and underground water sources, threatening the geysers and harming vegetation and animals. In this Andean highlands area, the “llareta” plant grows like a dense green cushion of moss. It is also home to the vicuña, a wild relative of the llama, and the vizcacha, a soft-furred rodent of the chinchilla family. In a bid to halt the project, the Atacama Council and the Women’s Network of El Loa staged street protests and appealed to the Inter-American Commission on Human Rights. Public concern grew in March, when the Regional Environmental Commission of Antofagasta slapped the company with a 180,000 dollar fine for irregularities and breach of contract. The company is refusing to pay. A geothermal concessions law was enacted in 2000, and as part of a policy to diversify the country’s energy mix, the administration of President Michelle Bachelet provided incentives for exploration of this unconventional renewable energy source. In addition to the Zoquete Ravine, there are other zones where boreholes are to be drilled. On Jun. 1, international bidding began on 20 areas of exploration, 15 in northern Chile. El Tatio’s future is also of interest to scientists. 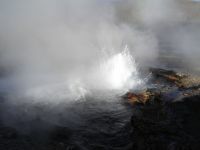 Pedro Zamorano and Rubén Araya of the University of Antofagasta study the bacteria that survive in the geysers where temperatures reach 80 degrees Celsius. There is great biotechnological potential for these bacteria in industrial processes. In an interview for this article, the researchers refrained from predicting possible negative effects of the geothermal plant on El Tatio. They see the main problem as being the lack of protection for the country’s biological wealth in microorganisms, given that foreign researchers are constantly visiting the zone.